I suppose this could be considered the ultimate bad beat. Having the pot awarded to the second best hand is a scenario that only occurs in a poker player’s nightmares, but this is precisely what happened on the Cake Poker network this past week. The hand in question took place in a micro-limit No Limit Holdem game where one player held KhKd vs. AhQs: The board ran out as 4c-4h-8-h-6h-9h. To the shock of everyone at the table, and the horror of the player with AhQh, the pot was awarded to the player with KK! The situation was quickly, and endlessly, discussed on the twoplustwo poker forum until Cake Poker spokesmen Lee Jones vowed to get to the bottom of the issue. Jones came back later with an update, calling the hand a 1-in-a-billion glitch that the site has now resolved. Jones also stated they would be awarding $500 to the wronged player (not bad considering the pot was just over $5) as well as $250 to the player who reported the incident, and a further $250 to the players who were dealt into the hand. 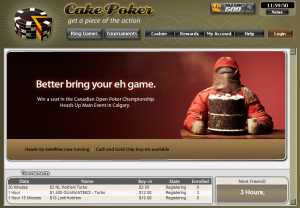 Jones also said Cake Poker would award $500 to any player who could provide a hand history of a similar occurrence –so far nobody has done so. This entry was posted on Tuesday, February 9th, 2010 at 4:54 pm and is filed under Poker News. You can follow any responses to this entry through the RSS 2.0 feed. You can leave a response, or trackback from your own site.